This important project had two main demands: to grant high quality of tropical fruits for long storage and to fit the air coolers in a very small height. Thanks good cooperation with the engineering company responsible for the designing and the installation, we have found the right solution to design customized air coolers much more longer than standard units and equipped with special blowing fans, with very high air static pressure, in order to achieve the right and uniform air flow through the product. We have also designed the air coolers extremely low in order to fit them into small slot between shelf unit and room ceiling. 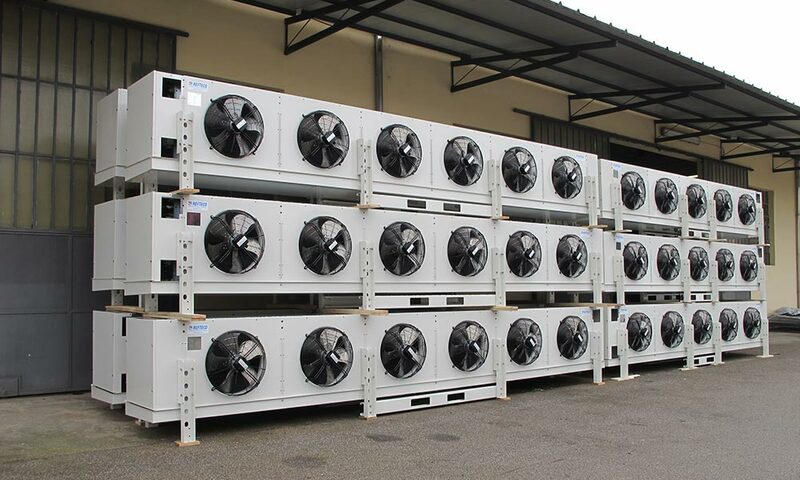 Industrial air coolers with blowing fans RGILB, water defrosting.